Darien defeated Greenwich 102-83 in a girls varsity swim meet in Greenwich, Conn. on Monday, Oct. 5, 2015. Two undefeated swim teams producing impressive performances before a loud, enthusiastic crowd — sounds like another dual meet to remember between rivals Darien and Greenwich High School. 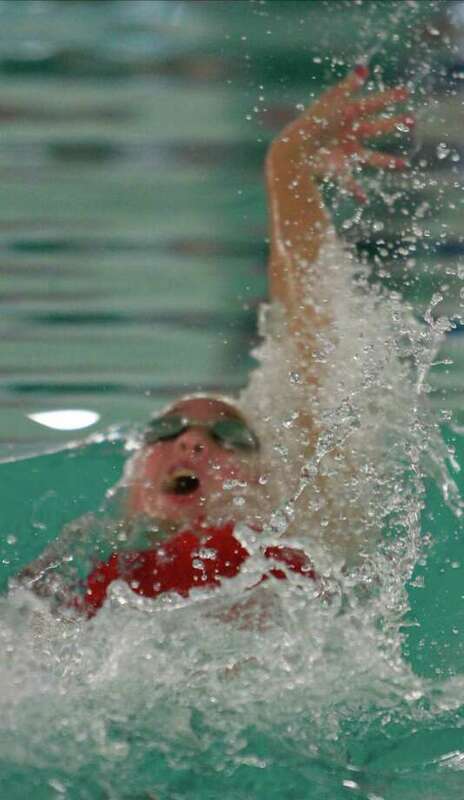 The Cardinals held a four-point lead over three-time defending State Open and FCIAC champion Darien after the 100-yard freestyle event, but the Blue Wave gained a slight advantage in the 500 freestyle, then did what most powerhouse squads do: they built upon it. Finishing strong, Darien kept its perfect season going, recording a 102-83 victory over host Greenwich in a key FCIAC meet. The Blue Wave (6-0) received two individual wins from Lauren Rutledge and Phoebe Slaughter en route to placing first in 10 of the 12 events. Darien also had some important second and third-place finishes, helping them gain points on Greenwich as the meet progressed. Greenwich (5-1) saw sophomore Kelly Montesi win the 100-yard butterfly (59.34) and sophomore Kate Russack take first the one-meter diving event. Darien’s Rebecca Maroney, Leigh Harrison, Maggie Orem and Lauren Rutledge won the 200-yard medley relay (1:53.11). Senior Belle Stobbie gave the Blue Wave a first-place finish in the 200 freestyle (1:58.07), edging Greenwich’s Sophia Jahan (1:58.88). Slaughter won the 200 individual medley, while GHS senior Brooke Collins was the runner-up (2:12.50) and Montesi placed third (2:14.00). Rutledge’s first individual victory came in the 50 freestyle (24.73). Samantha Scott (25.07) and Louisa Bjerke (25.65) were second and third, respectively, for the Cardinals. The Cardinals took a 41-37 lead, courtesy of their divers. Sophomore Kate Russack was a standout on the one-meter diving board, earning a winning score of 244.75. Freshman Annabelle Pollack of Greenwich placed second (232.05), followed by Darien’s Jenny Schrenker (222.2). Montesi (59.34) and Lilly Clisham took first and third, respectively, for the Cards in the 100 butterfly, then Darien placed first and second in the 100 freestyle. Rutledge was first in 53.59 and Belle Stobbie was second (55.27). In one of the most exciting races, Kate Murray of Darien was the 500-yard freestyle winner (5:16.16), with Jahan placing second (5:16.26) and Carly Rutledge of the Blue Wave finishing third. The 1-3 finish gave Darien a 64-62 lead. “Greenwich swam awesome tonight, they were right there with us and made it a great meet for us,” Trifone said. Slaughter took first in the 100 backstroke in 1:00.11, while Maroney was third (1:01.47), giving the Blue Wave an 85-71 edge. Samantha Scott was the runner-up for GHS (1:00.24). Harrison touched the wall first in the 100 breaststroke (1:09.64), with Collins finishing second (1:10.61) and teammate Riley Ennis taking third (1:13.60). The Blue Wave also won the 200 and (1:41.41) 400 freestlyle relay (3:41.94). 200-yard medley relay — 1. Darien (Rebecca Maroney, Leigh Harrison, Maggie Orem, Lauren Rutledge) 1:53.11; 200-yard freestyle — 1. Belle Stobbie (D) 1:58.07; 200 individual medley — 1. Phoebe Slaughter (D) 2:10.73; 50 freestyle — 1. Lauren Rutledge (D) 24.73; Diving — 1. Kate Russack (G) 244.75; 100 butterfly — 1. Kelly Montesi (G) 59.34; 100 freestyle — 1. Lauren Rutledge (D) 53.59; 500 freestyle — 1. Kate Murray (D) 5:16.16; 200 freestyle relay — 1. Darien (Belle Stobbie, Phoebe Slaughter, Isabel Blaze, Lauren Rutledge) 1:41.41; 100 backstroke — 1. Phoebe Slaughter (D) 1:00.11; 100 breaststroke — 1. Leigh Harrison (D) 1:09.64; 400 freestyle relay — 1. Darien (Belle Stobbie, Carly Rutledge, Maggie Orem, Phoebe Slaughter) 3:41.94. Records: Darien 6-0; Greenwich 5-1.